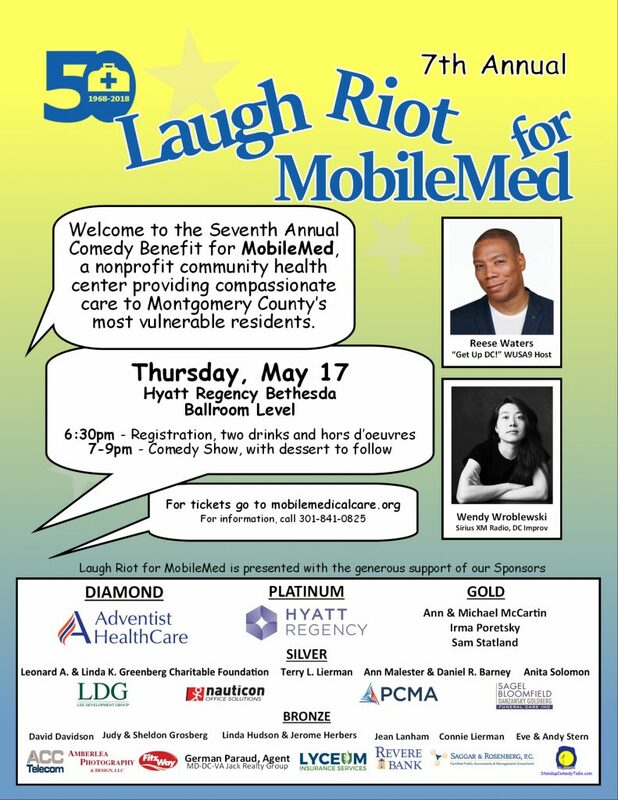 MobileMed’s Annual Comedy Show is back for the 7th year! Purchase General Admission Tickets by clicking here or by clicking on the flyer below; Purchase Young Professional (40 Under 40) Tickets here. We are pleased to announce that the evening’s entertainment will be provided by comedians Reese Waters and Wendy Wroblewski! Reese Waters was born in Prince George’s County, MD and went to St. Albans School in Washington DC before moving to New York City to get his BA in Economics from Columbia. While in college, Waters began performing comedy at local open mics, and after college, he moved to San Francisco to pursue different styles of comedy. After two years, however, he returned to the east coast, where he is now based. He has performed on MTV, Good Morning America, the Early Show, NPR, and others. He is currently the host of Get Up DC! on WUSA9. Wendy Wroblewski is a stand-up comedian and math tutor from Gaithersburg, Maryland. A regular at the DC Improv, she performs comedy all over the Washington, DC metro area. She was a guest on the Underground Comedy Festival and the DC stop of the Betches of Comedy tour. She won the 7th edition of the DC Improv’s Comedy Kumite tournament. You may have recently heard her as the host of Comedy Central Live on Comedy Central Radio Sirius XM. She has opened for Adam Cayton-Holland, Gary Gulman, Ryan Hamilton, John Heffron, Brent Morin, Mike Recine, Chris Redd, Liza Treyger, and Bengt Washburn. Join us at the Hyatt Regency Bethesda for an evening of great comedy and food!